Apple reported historically high quarterly revenues, largely thanks to its iPhone sales, and few would deny that much of the company’s success can be attributed to the iconic Steve Jobs -- entrepreneur, inventor, visionary and former Apple CEO. 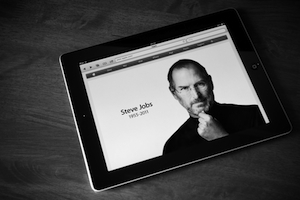 From Jobs' powerful presentations skills to his business philosophies, there's no shortage of learnings. View SlideShares on Jobs and share your favorite lessons from Jobs, too. Known for delivering awe-inspiring and captivating presentations, Jobs always practiced his presentations down to the last detail. From building on a central theme to demonstrating enthusiasm, here's how you can present like Jobs. Join more discussions on SlideShare! View our 2015 Upload Campaigns Calendar.